Cows rest in a field at Waseda Farms. Photo by Dan Eggert. It isn’t every day a person gets to amble amongst the livestock before purchasing the week’s meat. Many of us are in the habit of forgetting that our favorite cut of steak or a nice, juicy burger comes from a cow. McDonald’s sells Angus burgers nowadays. How many of us know “Angus” simply refers to the breed of cattle, and not how it was handled or how the meat was processed? I drive past so many farms in northern Wisconsin it’s dizzying. Yet, when I go into a major grocery store, it’s difficult to find local meat. I pick up an unmarked package with no indication of where in the whole, wide world that Angus patty originated. 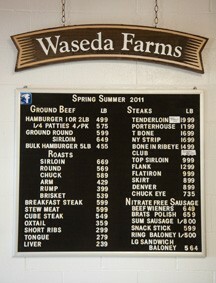 Places like Waseda Farms, located on Logerquist Road in Baileys Harbor, make it easy to get the satisfaction of knowing exactly where that steak came from. Just look out to the rolling hills of over 300 acres of farmland. He’s looking for a pair of Aberdeen Angus twins, male and female. Waseda also has Hereford cows and Black Baldy cows (a cross between Aberdeen Angus and Hereford). Ninety percent of the time, Lutsey tells me, twin babies will be sterile. At this moment we realize the female calf has escaped; she probably slipped underneath a fence somewhere. We spend some time combing the outskirts of the paddock. Cows graze lazily, their pasture fresh and rotated almost daily. First owned by the O’Brien family, the Waseda property was given to the Priests of Sacred Heart as part of the St. Joseph’s Retreat Center in the 1950s. The Lutseys have owned and operated the farm for three-and-a-half years. Owner Tom Lutsey explains use of nitrogen branding in organics. 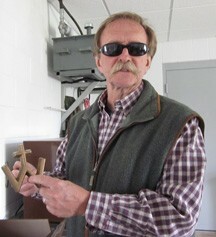 They are using the “W” with a cross built into the top with respect to the priests who owned the land before them, and whose cross still tops the hill on their land near County A. No cows will be back in the same field for 30 to 40 days. During that time they use a manure-smoothing device to redistribute and evenly fertilize the grass. 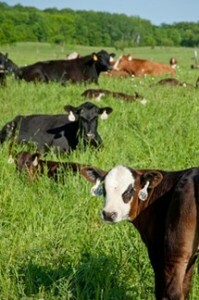 There are approximately 125 cattle on the Waseda Farms currently. When the cows move, so do their “toys.” They’re treated to a round of tasty cow supplements – organically improved, inorganic minerals – including selenium (helps cattle birth) and clay. They also have “beauty brushes” which help with good grooming and give them organic insect control. Lutsey points to a large, grey colored female. “I pulled her calf out on Sunday night. That’s the first time I had to do it all by myself,” he says. Tom Lutsey and his wife Sharon visited Door County from their home in Green Bay for many years before moving here permanently, about 20 years ago. They first bought a farm where they had a small number of cattle next to Kevin Kiehnau. “We used to be in the ice cream business, so I have a lot of agricultural background. We sold to Good Humor and worked for them for awhile before we bought our farm here in Door County,” Lutsey says. Waseda Farms is a Certified Organic farm; in addition, they take the treatment of their animals very seriously. Temple Grandin, famous American doctor of animal science and longtime consultant to the livestock industry on animal behavior, designed Waseda Farms handling system with partner Mark Deesing. Grandin, who is autistic, invented a “hugging machine” – an instrument that helped calm her down in a way a human hug could not. The machine allowed her control of the hug. In the same way, she designed a vice-like hugging machine for animals. The Lutseys are the first in Wisconsin to institute Grandin’s system, and the facility is truly unique, handling cattle in the most humane way possible. The animals are slowly led through a series of pens and pathways with precise measurements. The detail of her system extends all the way down to welding a small piece of solid steel rod along the bottom of the pathway to stop the cows’ hooves from slipping underneath the washout side. The system also makes vet visits much easier. It allows them to check the cow’s hooves, as well as take weights and measurements more often. It’s easy to see there’s no margin for error: the pathways are narrow to prevent more than one cow passing through at a time and to stop them from reversing. This makes the cattle calmer and reduces the risk of injury. While some farmers might think the system excessive, Lutsey has opened up his facilities to other farmers, enlightening them to its advantages. Another advantage Lutsey explains is the ability to closely track their animals. Today’s Farm Market store at Waseda Farms was the old meat processing building, as the meat is now butchered offsite. Inside, they’re selling Carr Valley, cave-aged cheese, asparagus, rhubarb, salad, organic honey, and breads made by a descendant of the O’Brien family. Also for sale are Organic Valley chickens and locally raised chicken eggs. “Eventually we will sell mostly our own produce. We’ve planted raspberries, blackberries, strawberries, rhubarb and three dozen heirloom tomato plants,” Sharon says. The Lutseys will sell their Waseda Farms, organic, grass-fed beef at the Jacksonport Farmer’s Market on Tuesdays. Who has the happy cows now, California?